These are my live-blogged notes from a Learning Skills Group webinar, hosted by Donald Taylor. Forgive any typos or incoherencies. “The rule for Learning Management Systems is we shouldn’t call them Learning Management Systems.” Do it at the point of need. Don’t even call it learning anymore. A learning platform used to do – it had the ability to target a specific group of learners and provide a nice catalog, dividing into groups of courses and targeting groups of people to push out the right content. That can be accomplished very well from today’s learning systems. The “invisible LMS” – the engine for learning stays, but the way it manifests to the user is key. If you can decouple the back end engine from the front end interface, then there’s a lot of benefit. Learning can be delivered where you work. Accessing learning at the point of need – for performance support or general knowledge discovery. xAPI/Tin Can – takes people away from the notion of packaging content. Lets the creators of the learning – the catalogs – let them be where they are. Learners can go there – just make sure you capture that activity. Activity capture – making sure as a company you should understand where people are going to find what they need. Tie learning to skills assessment. Some done formally, some on the job, some informally. Learning tied very specifically to skills assessments makes for immediate prescription for the learning need. The key to the success of many learning initiatives. It’s not enough to just provide a great content to learners and say “go figure out what you want…” That won't meet your objectives. With every learner – there’s a few things your department/manager expects of you, then there’s also the learner’s own innate curiosity to keep up with what they need to do. Marrying these two is so important. The paradox of choice – we use smart or intelligent systems when choosing movies and shopping. Why not for learning? How can we provide intelligent recommendations for learning? You have to USE the system. E.g., the more you watch Netflix, the more it understands what you like and can provide recommendations. And they’re not perfect, but they make an attempt. And it’s better than having nothing at your disposal…at Netflix, we tend to lean a lot on the trends and recommendations on the home page. And then it suggests things that you might like based on past choices. For this to be effective, you have to have usage in your system. The goal of intelligent recommendations is really personalization. The more people use it, the smarter it gets. Making systems easy to use and consumer-grade experiences – that just enough notion – these are key to driving usage. This is very much a work in progress. Hopefully we’ll see solutions getting better and better at this. Intelligent learning platforms matter: the system works for you. It’s proactive, dynamic, personalized (no two learners get the same recommendations), engaging. The more you interact, the better the system works for you. It’s not about taking ALL of your content and resources and shoving them onto a mobile device. 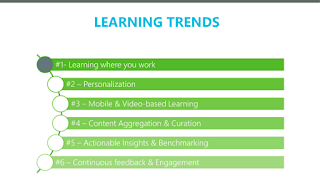 How can mobile learning reinforce? Draw people into the system? It maybe isn’t always about content consumptions. Let’s look at mobile NOT JUST for content consumption. Let’s complement the courses you’re taking elsewhere. Instead let’s go bite-sized. the job of the learning platform to start providing curation – these are the systems that know about the employee/the learner. Curation, personalization, a rich profile – these are all related. The more you know about learners and their usage patterns, you can make that learning more prescriptive and specific to them. And managers have a role to play here. Who knows better about the employee than their manager? Analytics – have moved from operational reporting to more advanced/predictive analytics. Predictive analytics = development of predictive models, scenario planning. Benchmark – compare, act, improve. A lot of data available to managers where they can benchmark many talent management processes. And they can take action to improve company performance and organizational objectives. Many companies do have enough data at a higher level to compare against other companies in the same space. Need to start with better reporting and dashboards. Employee feedback and survey tools – and the talent management platform on the other side. However, the feedback tool has been disconnected from other systems and processes. Need to have feedback tools that are tightly connected to organization and employee performance (according to Brandon Hall). Most orgs don’t have a lot of time to create content, push it out, send a survey after six months or a year and then revamp content. We need quicker creation and authoring. We need smaller loops. Ways to tailor and calibrate faster. Employee engagement/pulse systems will get simpler, more personal – leaders at every level will be able to target this. And then connect learning back to employee performance. Make the connection of continuous learning and development with engaged, high performance business. Boston Area! Are you swimming in a sea of LMSs? Are the feeding chum to all the vendors out there and the waters have started to churn around you? Want to make some sense of these treacherous seas? Join me at ATD Boston Shark Tank: The LMS Edition on Dec 8. (I'll be one of the sharks and I promise to make a lot of corny shark references). In case you haven’t heard, ATD-Boston is closing out the year with a big splash and you WILL NOT want to miss this one! Three of our local sharks will be sinking their teeth into presentations from three very popular LMS vendors -- then you’ll get a chance to wear the shark hat as well. All this takes place at a brand new venue (Babson College) and at this prestigious institute of higher learning, we promise that you will leave with an excellent education about the world of LMSs. Cammy Bean, VP of Learning Design, Kineo eLearning: A premier thought leader in the eLearning industry, frequent presenter at local and national events, and author of the Learning Circuits and Learning Visions blog. Barry Richman, Sr Manager of Global Learning Systems, Dunkin Brands: A veteran in the eLearning industry with a deep background in LMS operations who has most recently helped Dunkin Brands with their deployment of a new LMS for their 100,000+ users. Jean Marrapodi, Illumina Interactive: Winner of a 2016 eLearning Guild’s Guild Master award and 2014 awards from Brandon Hall and USDLA for best learning team and best learning program, frequent presenter at local and national events, and recent addition to the staff at Illumina Interactive. Cornerstone on Demand: An industry leading LMS that has rapidly become one of the most popular learning environments in the world. Cornerstone is used by almost 30 million people in 191 countries. Grovo: An “edgy” LMS that focuses on modern learning in today’s workforce by embracing micro-learning and customized packaged content that is delivered in bite-sized chunks. eLearning Tool LMSs: LMS environments that are already at your fingertips if you use eLearning development tools from vendors such as Articulate, Adobe, Lectora, and iSpring. Do they have enough power to meet your needs? That will be up to you to decide.